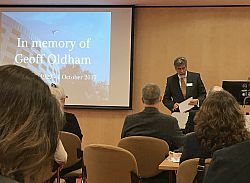 ‘The Life and Legacy of Geoff Oldham’, held at the Conference Centre at the University of Sussex on 13 April 2018 was co-organised by SPRU and the International Development Research Centre (IDRC), with support from the Institute for Development Studies (IDS). The purpose of the event was to celebrate Geoff’s pioneering work in science and technology innovation (STI) for development, and discuss how to build on the enormity of his legacy in this field. Professor Francisco Sagasti paid a moving tribute to his friend and former colleague on the Science and Technology Policy Instruments (STPI) programme, which took place at IDRC under Geoff’s leadership. The event was attended by many of Geoff’s former colleagues, friends and family members, who had travelled from all over the world. Professor Johan Schot (Director of SPRU) opened the day’s proceedings, welcoming all those who had come from near and far to attend. Johan reminded everyone that the workshop was a celebration of Geoff’s work but also an opportunity to look forward and bring attention to the work that is still to be done. After a brief show reel summarising Geoff’s career, Johan Schot read a message from Alan Freeman, whose father, Professor Chris Freeman (1921-2010), founded SPRU with Geoff in 1966. Alan’s message concluded with a poignant remark, setting the tone for the day: “Chris and Geoff changed the world for the better”. In the morning sessions, there were presentations looking back over Geoff’s career achievements at SPRU and IDRC, with a particular focus on the pioneering Science and Technology Policy Instruments (STPI) programme, which took place at IDRC under Geoff’s leadership. Insightful reflections were offered by Professor Keith Bezanson (Former President and CEO of IDRC) and Professor Francisco Sagasti (coordinator of the STPI project), as well as Professor Martin Bell and Dr Adrian Ely from SPRU. A special presentation given by Dr Sophia Huyer (Gender and Social Inclusion Research Leader for Climate Change, Agriculture and Food Security – CCAFS) focussed on the substantial support Geoff gave to the gender dimensions of science and technology studies and his championing of the role of women in research – something to which Geoff had been particularly proud to have contributed. The afternoon session opened with an introduction from the Vice-Chancellor of the University of Sussex, Professor Adam Tickell, followed by a special video tribute from friends and former associates of Geoff’s from China. Geoff had a significant relationship over many years with key figures from China in the area of STI policy. This heartfelt tribute from, among others, Professor Xue Lan (Dean of the School of Public Policy and Management, Tsinghua University) and former Minister of Science and Technology in China, Ms Zhu Lilan, was a very welcome addition to the day’s programme. The aim for the afternoon was to discuss the present and future of STI research, particularly in relation to contemporary policymaking processes for development: for example, how can future research in this area build on the key concerns developed by Geoff during his career, and influence the capabilities of developing countries to establish and advance their own STI-related policies? Thoughtful perspectives were offered on this subject by Dr Federico Burone (Regional Director, Latin America and the Caribbean, and Temporary Leadership Responsibilities, Program and Partnership Branch at IDRC), Professor Johan Schot and Professor Melissa Leach (Director of IDS). Transformation was a predominant topic in the discussion. Professor Schot argued that, in order to address the United Nations’ Sustainable Development Goals (SDGs), there needs to be a stronger focus on transformation rather than simply hitting targets. This includes transforming how we innovate. 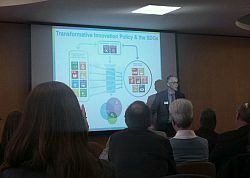 He demonstrated how the Transformative Innovation Policy Consortium (TIPC) sets out a new view for addressing and implementing the SDGs. Johan added that Geoff Oldham had encouraged him to establish TIPC and he credited Geoff for setting the foundations that made possible the creation of TIPC. The project’s focus on implementation and achieving practical solutions contributes to Geoff’s legacy at SPRU. Professor Johan Schot demonstrated how the TIPC project’s focus on implementation and achieving practical solutions contributes to Geoff’s legacy at SPRU. Professor Leach also argued that innovation must become more transformative to address pressing global challenges. She introduced the Sussex Manifesto, the earliest example of productive collaboration between SPRU and IDS. This piece of work was revisited 40 years later by SPRU and IDS, under the umbrella of the STEPS Centre, and a New Manifestowas launched. The idea now was to shape STI to work more directly for goals around social justice, poverty alleviation and the environment, mobilise substantial cooperation and collaboration, build partnerships, harness different forms of diversity and ensure accountability. Melissa acknowledged the complex global developments that have happened in the years since 2010 that make the aims of the New Manifesto just as important today, if not more so. An updated manifesto, however, should emphasise how transformative pathways to economic development need to be set in a way that is manageable within the world’s ecological limits. Research and innovation for transformation must steer societies towards equitable sustainability. The contents of all these engaging presentations provided a rich source of comments and questions from many in attendance. There was a reinforced commitment from SPRU, IDRC and IDS to maintain the collaborative relationships fostered by Geoff through his career. Professor Bezanson closed the event with the announcement of the Geoffrey Oldham Memorial Scholarship Fund. He offered his gratitude for all who had helped make them possible. Several Geoffrey Oldham scholarships are available for Masters study at SPRU in 2018 –2019 and 2019 –2020. The scholarship fund has been deemed by many as a perfect contribution to Geoff’s legacy. Through these scholarships, Geoff’s passion for education and for ‘passing on the light’ of learning is celebrated and preserved by passing the torch on to the next generation. This story was originally published on the SPRU website.